This month's My Paper Pumpkin offering is so much fun! For this card, I followed the directions in the flyer that comes in each package. Those who know me will realize that "SERIOUSLY" is one of my favourite words - LOL! - so when I saw that it was one of the images in the card kit, I was THRILLED!!! 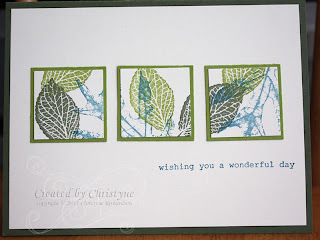 I can definitely see me pairing it with other sentiments in the Stampin' UP! line. This card was inspired by a similar card I saw on Pinterest. 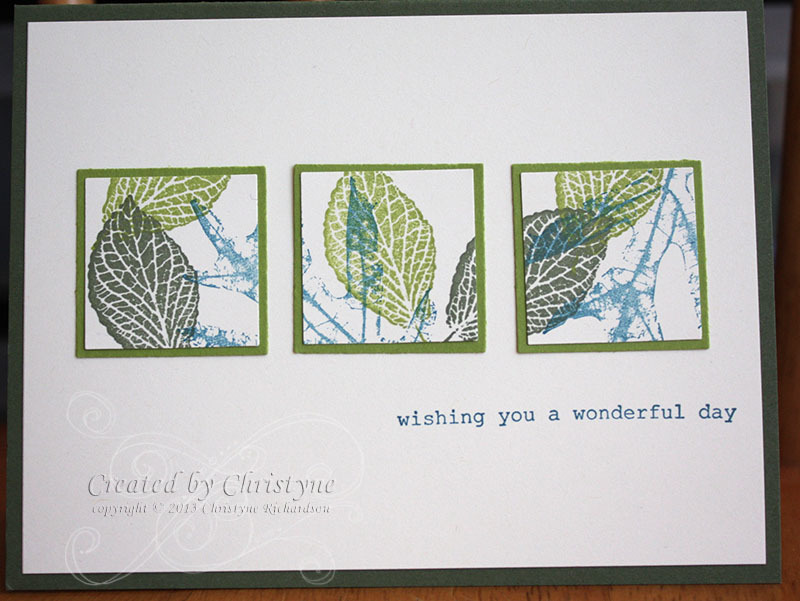 It uses French Foliage and a sentiment from Bring on the Cake. And once again, I have a step by step tutorial available for sale for just $2.95. Class participants will have the tutorial emailed to them following class. Special Offer for class on May 4th! 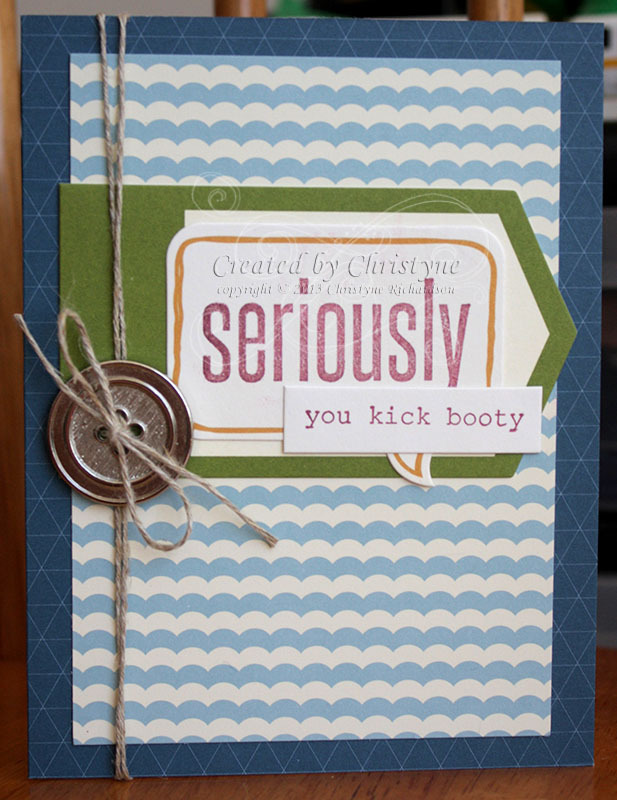 Are you coming to class on May 4th to create your Manly Man cards? Would you like to come? I've got a special offer for those planning on coming! We'll be using one of my favourite sets to create three of the cards during class. If you order your set from me BEFORE class, not only will you NOT have to wait your turn because you'll be able to use your own set, but you'll ALSO save $5 off the class cost! To ensure that your set will arrive in time for class it must be ordered no later than April 24th. When the FedEx man showed up with my Paper Pumpkin! It's a NEW MONTH and a new month = a new paper pumpkin! This time, I managed to get the sticker off without ripping the paper!!! 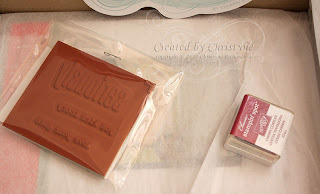 Here's the ink and stamps: Cherry Cobbler and THREE sentiments to play with this month! 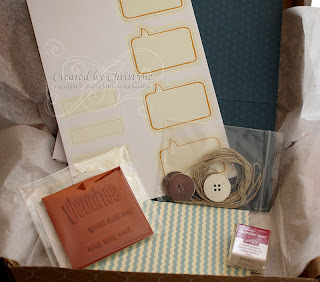 Here's the open package with the card guts still tucked away. 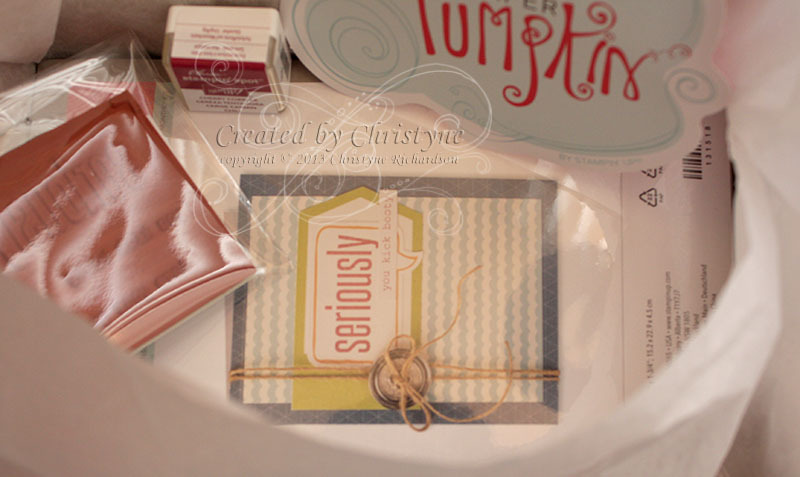 Don't you just LOVE that "SERIOUSLY" stamp? I know I do...particularly because I say, "SERIOUSLY?" ALL. THE. TIME. Seriously. And here's all the card guts. If I get time, I'll play with these and try to get some cards (both standard and stepped up!) on here in the next couple of days. I have other deadlines, so no promises. 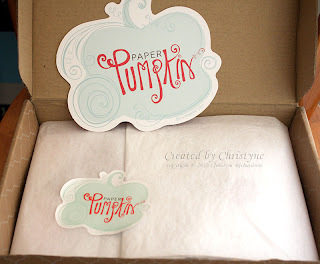 Have YOU subscribed to My Paper Pumpkin yet? Go HERE to get started now. 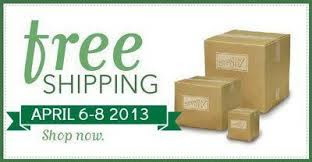 Be sure to select me as your demonstrator so that I can be sure you're getting your goodies on time every month. 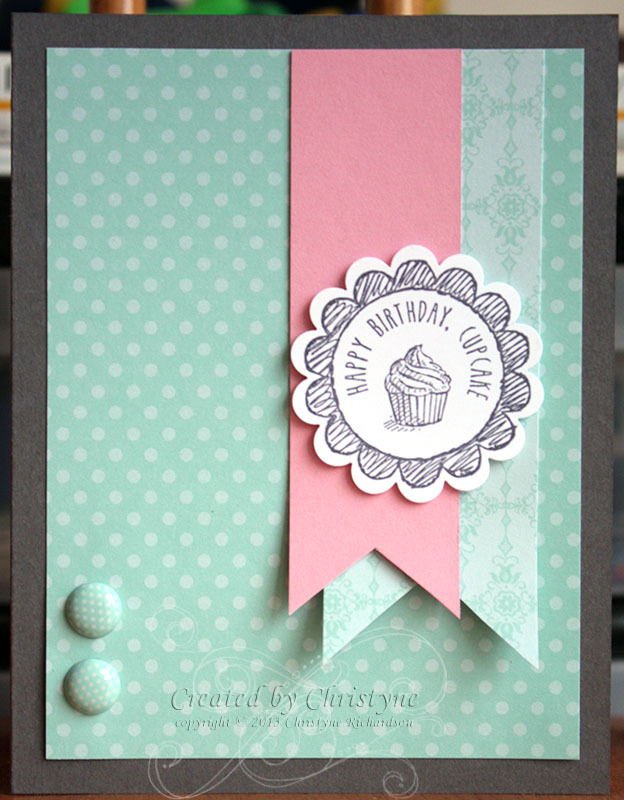 Pink and Blue for the Paper Craft Crew! O.K., so it's not REALLY blue, but it has blue undertones in it, right? Plus...I had to make it rhyme - LOL! I used the same colours as I did on yesterday's card, mostly because I had them out, but also because I really like the way they work together! Once again, I started off with a Basic Grey Base and added a layer of Pool Party DSP. 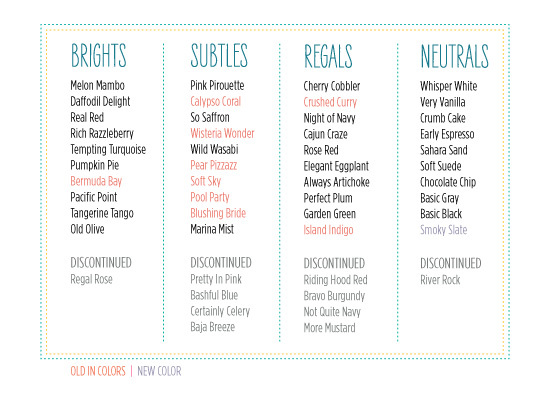 With our colours being refreshed, I *think* (but don't quote me!) that our DSP stacks will be changed up, so if you like the designs in the CURRENT DSP packs, NOW is the time to get them! 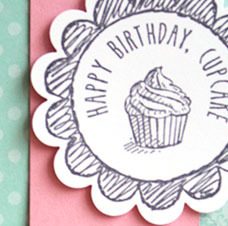 I used some of the other images in Sketched Birthday, so you're getting more of a sneak peek! There's still a few more that I haven't shared, so you'll still have the opportunity to be surprised on June 1st! The images were stamped in Basic Grey, Pretty in Pink and Pool Party and once again, I added Pool Party Brads as the final touch. Also, while there is a die available for the shape with the sentiment (and I *do* own it), I was a little too lazy to walk across the room - sad, I know - so I hand cut the shape. Bet you couldn't tell, eh? 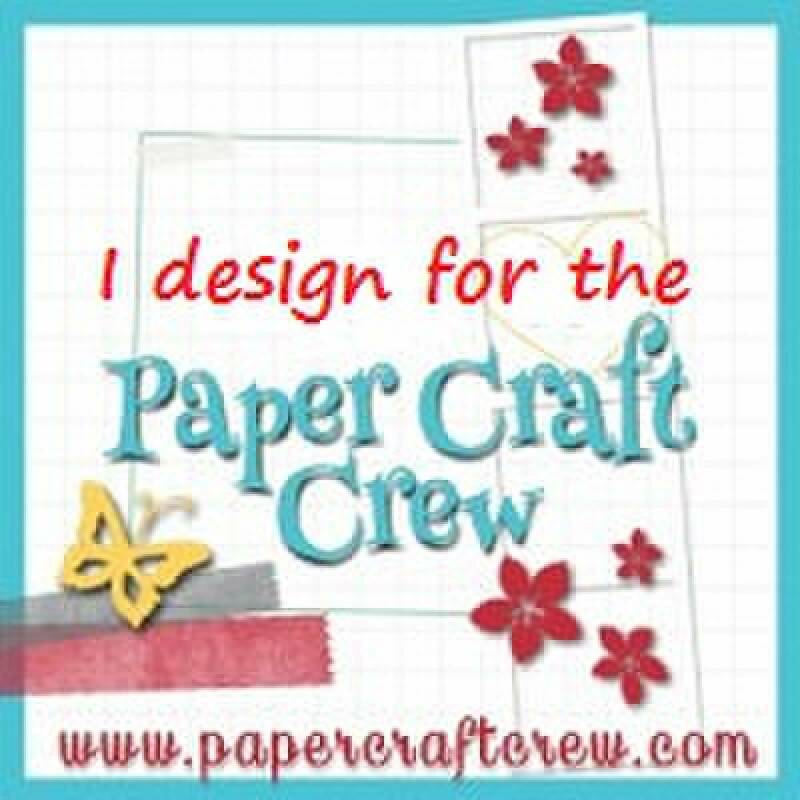 Don't forget to check out what the rest of the Paper Craft Crew has been up to! I've had this little set since January and have only inked it up twice! Can you believe that?? I think I've been afraid to use it because I didn't want anyone to fall in love with in and want it RIGHT. THIS. MINUTE. But, we're coming up to a new catalogue year and this adorable set will be in it! You'll be able to order yours as early as May 31st! Today's card was created for the Utah Divas colour challenge: Basic Grey, Pretty in Pink (retiring), Pool Party (staying - YAY!) and a neutral of choice. I pulled my colours first and then decided on a stamp set. Everyone needs a stash of birthday cards, right? 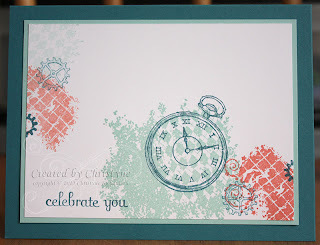 I started by stamping the image from Sketched Birthday in Basic Grey onto Whisper White Cardstock and punched it out with my 1 3/4" Scalloped Circle. 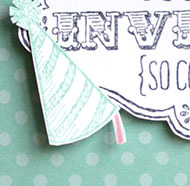 I love the idea that this stamp set looks like someone just came along and scribbled out a design! Then I had some Pool Party DSP that was already out, so I cut it to fit the front of the card and then cut a second piece for the banner. I also cut a piece of Pretty in Pink a bit smaller for a second banner. 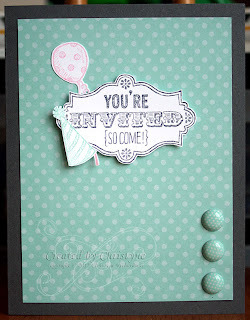 These were stacked and then I added the stamped image with some Stampin' Dimensionals. Some Pool Party Brads from the 2011-2013 brad collection were added as the final touch. More Money = More Products! and get ready to join the fun! I'll assume you said bad first, since that's pretty much what everyone says and go with that. So, the bad news is that the retiring colours Stampin' UP! announced and that I posted about here are going fast! I've heard word that some of the re-inkers are already sold out. That means if you want any of the retiring colour product you shouldn't wait! I was working on my cards for my next class (May 4th) and since I had Clockworks out, I thought I'd use if for today's Utah Divas Colour Challenge. Our colours this week are: Pool Party, Island Indigo, Calypso Coral and a Neutral of our choice (I chose Whisper White). I love the way it turned out! You could also turn this into a single layer card by just using Whisper White. IMO, this falls into the CAS (Clean and Simple) category of cards. 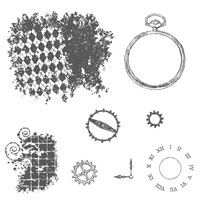 Lots of white space with a splash of colour gives the eye a place to rest and then still have fun with the Clockworks Collage. And...if you left off the "celebrate you" from Fabulous Phrases, you could make the whole card with just one set! For three days only! Starting today and ending at 11:59 p.m. on Monday night! Back in 2010 when Stampin' UP! announced the first colour renovation, demonstrators found out that every 3 to 5 years, there would be a mini renovation of sorts. Guess what? It's been three years! I'm pretty excited about these In Colours that will now be part of the regular line up and also SUPER excited to see what this new "Smoky Slate" looks like. This announcement also means that EFFECTIVE IMMEDIATELY, these retiring colours (and everything that coordinates with them - ribbon, buttons, brads, etc...) will ONLY be available while quantities last. So...if you're partial to any of them, best order them NOW.